Kirkstall Abbey is definitely a Unique Wedding Venues, and they don’t get much grander than this! We were over the moon when Caroline & John dropped this into our first ever conversation. We know Kirkstall Abbey well. We’ve used it as a pre-wedding shoot venue before, but we were thrilled at the thought of covering an actual Leeds wedding there. We headed over to Caroline’s parent’s house, which was great as we weren’t all on top of each other. Balloons inflated. Champagne popped and poured. Makeup applied and hair in progress. Pit stop for some Sushi and a brew. Happy days! After a couple of hours, I headed across Leeds to see what John, the groom, was up to. Not exactly the prep shots we’d planed, as John was already dressed! Same as the Groomsmen. Oh well, another brew and a mini pork pie it is then! Onward to Kirstall Abbey and there placed our bags at the end of the worlds longest aisle (not officially of course!). Guests arrived and mingled, and before long seats were filled and the waiting began. Kirkstall road had it’s usual Saturday traffic, so of course Caroline was a little late. It was smiles all round when she eventually walked the aisle towards the Groom. Propped up by her smiling dad, it was perfect. I Do’s and signing complete, we grabbed a few shots as they walked from their guests. The we headed back into the Abbey to get some some more personal memories for them. Light rain? Meh! 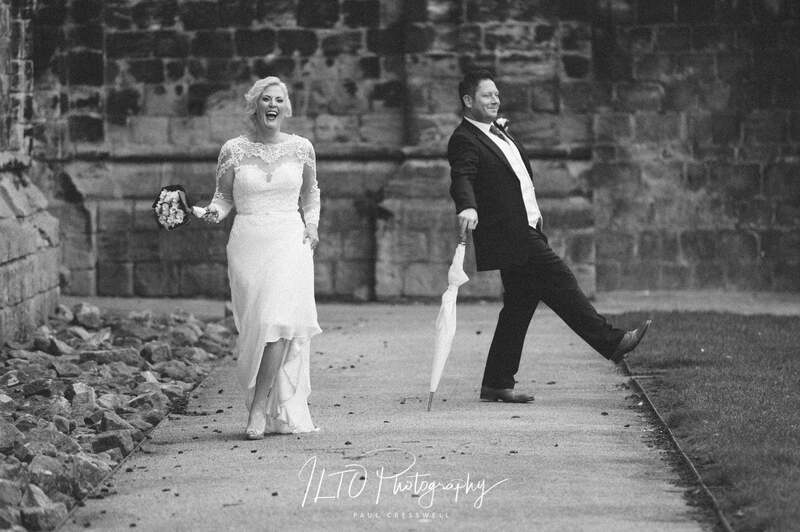 Thankfully there was a spare umbrella, so we used it in the pictures and got some belters! It made a refreshing change for us as they didn’t want any formals, and it was nice to be able to get some creative shots done. When that was done we headed back to meet the other guests, and we managed a quick confetti shot too! At 5pm we headed over the road (literally) for the wedding breakfast and speeches, and before we knew it we were getting our first dance shots. Amazing venue. Great couple. Great shots. Happy photographers!